* This memo was prepared for the “Islamist Social Services” workshop, September, 23, 2014. A third account, and the one I tend to agree with, is that Islamists simply possessed greater opportunities for service provision than their rivals. A traditional society replete with mosques and Islamic social service organizations in which, as Janine Clark has documented, both Islamists and ordinary citizens are embedded, provides religious actors with numerous conduits through which to reach potential voters. A Muslim Brotherhood member who is also a board member of a local Islamic charity is going to be able, at election time, to festoon the offices of that charity with Muslim Brotherhood posters and campaign materials, and to piggy back off of the charity’s ties within the community to identify potential targets for clientelistic appeals (particularly after the fall of Hosni Mubarak, when restrictions on such activities were lessened). For leftist politicians, who are just not as likely to participate in these forms of religious life, there are no real analogues to the religious networks available to Islamists. Labor organizations, which one might expect to serve this function, and which form the backbone of leftist parties around the world, are weak and inchoate in Egypt (a function of both government manipulation and the country’s relatively underdeveloped industrial sector). This is not to say, however, that non-Islamists were bereft of means of servicing voters—after all, the other great “traditional” form of organization endemic in Egypt is, as several scholars have noted, the institution of the “local notable,” rooted in the patriarchal affective ties that characterize rural life. Goods provision has always been an important part of how these local notables garner support, and it is why the only real challenge to Islamists at the local level has ever come from these kinds of actors. During the Mubarak era, many of the most potent local notables were co-opted by the ruling party. After Mubarak’s fall, the power of these notables was temporarily disrupted by the dissolution of the ruling party and a shift in electoral rules that raised the costs of political participation, leaving the political landscape more or less open before Islamists. The upshot of the above discussion is this: To the extent that service provision is a determinant of Islamist success, it is best conceived of as an intervening variable in a longer causal chain, in which developmental factors and regime strategies combine to create a dearth of opportunities for non-Islamists (particularly leftists) to engage in the same strategies. What do Islamist social services do? Now, the account I’ve offered above assumes that Islamist social service provision is an arrow in a largely clientelistic quiver. But this is not the only way of conceiving of it. There are three alternative ways in which service provision may be operating to generate support for Islamists. None of these accounts does violence to the basic intuition I’ve offered above, but they do provide alternative predictions as to the durability of an Islamist support base created by service provision. The first holds that commitment to Islamism is actually logically prior to the receipt of Islamist social services. In this telling, services are a “selective incentive” offered to in-group members. In other words, in order to take advantage of Islamic clinics or services, you must be an Islamist. The second account posits that services are offered as a way of creating Islamists. Here, as with the clientelistic account, support for Islamists is logically subsequent to service provision, which serves to put the recipient in close contact with Islamist providers and facilitate some process of ideological change. Finally, the third alternative account (advanced by, among others, Nathan Brown and Melani Cammett and Pauline Jones Luong) is that Islamist participation in social service projects are simply opportunities for Islamists to build reputations for effectiveness, pro-social behavior, and other positive qualities that stand them in good stead at the ballot box. Each of these mechanisms leads to different expectations regarding the staying-power of support for Islamists that is generated through service provision. If social services are merely part of a clientelistic strategy, it should not have much persistence beyond the last election. If it is offered only to Islamists, or creates Islamists, then we should find the relationship between Islamist support and receipt of Islamist services to be robust over time, even in the face of shocks such as the defamation campaign suffered by the Brotherhood in the wake of the June 30 protests and subsequent military coup. Finally, if social services merely create positive reputations for Islamists, then these reputations (and support for Islamists) are potentially open to disruption as voters receive alternative information about those groups. In the remainder of this memo, I want to try to offer a very preliminary test of these mechanisms. Specifically, I want to see whether the relationship between receipt of Islamic services and support for Islamists changes over time. Our baseline measure of the relationship comes from a survey I conducted with colleagues around Egypt’s first post-Mubarak parliamentary election (November-January 2012). 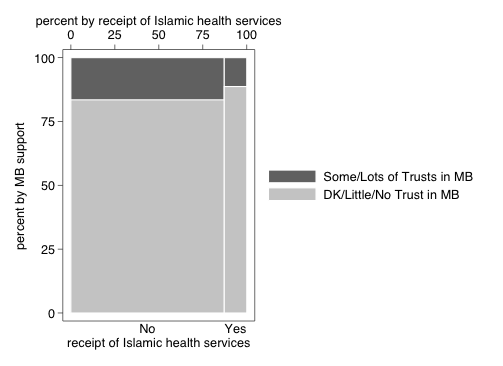 A nationally representative sample of 1,675 adults were asked whether they had ever used health services attached to a mosque or an Islamic charity. Only 347 of them answered in the affirmative. Of these, 147 (or 42 percent) said they had a “lot of confidence” in the Muslim Brotherhood, and 86 (or 25 percent) said they had a “lot of confidence” in the Salafi Call Society (the Muslim Brotherhood’s main Islamist counterpart and sometime rival). So, our baseline is that there was a strong relationship between the two things, further reinforced by the fact that recipients were more likely than non-recipients to trust the Brotherhood (42 percent to 33 percent) and the Salafis (24 percent to 20 percent). 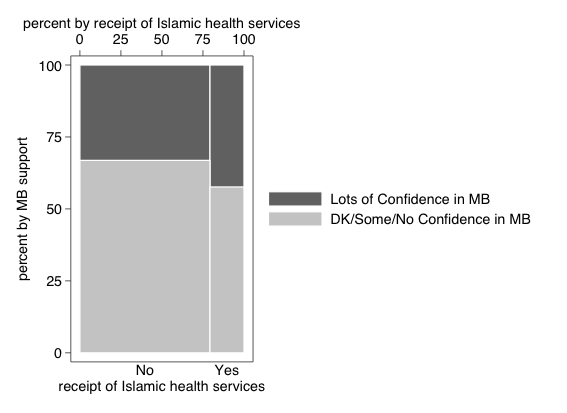 This is represented graphically in the “mosaic” plots in figure 1, which show the conditional distributions of support for each party and receipt of Islamic health services. In a survey conducted in May 2014, we asked similar (but, alas, not identical) questions to 1,312 adult Egyptians. 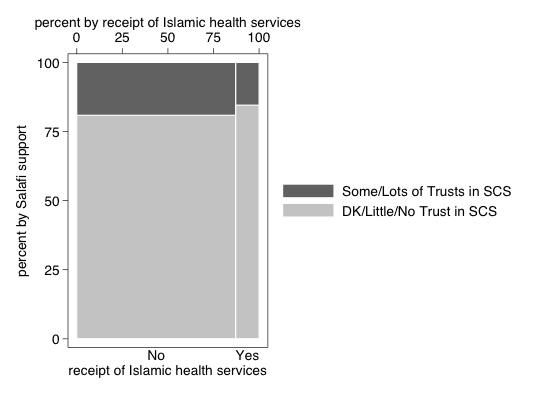 First, respondents were asked whether in the previous two years they had relied on healthcare services attached to a mosque or Islamic charity. Only 168 said they had. This is probably due to a combination of the temporal limitation we introduced to the question (in 2014 we asked about the “previous two years,” whereas the 2011 survey did not include this phrase), and fear of being associated with Islamists at a time when they were actively being repressed. What this means is that our results should be biased in favor of showing a strong relationship between social service receipt and support for Islamists, because it’s likely that only the most committed would proudly declare their association with organizations then in bad odor. We then asked people if they had “no trust,” “some trust,” and “lots of trust” in the Muslim Brotherhood and the Salafis. Because so few people were willing to evince lots of trust in Islamists, we code as having high trust anyone who said “lots” or “some,” on the reasoning that even declaring “some” trust in a group like the Muslim Brotherhood was a fairly bold statement at this particular moment in Egyptian history (which was, incidentally, in the weeks prior to Abdel Fattah al-Sisi’s election to the presidency). Again, this was likely to have the effect of biasing our results in favor of showing a strong relationship between social service receipt and support for Islamists. Instead, of the 168 people who reported reliance on Islamic services, only 19 (11 percent) said they had “lots of” or “some” trust in the Brotherhood, and only 26 (15 percent) said they had “lots of” or “some” trust in the Salafists. It’s worth nothing that, in terms of absolute percentages, fewer recipients of Islamic services trusted the Brotherhood than non-recipients (11 percent vs. 16 percent), and the same is true of the Salafis (15 percent vs. 19 percent). This is represented graphically in figure 2. What this suggests is that Islamist services are likely to generate support through the strictly clientelistic mechanism or the “reputation-building” identified by Cammett and Jones-Luong and others, both of which are consistent with the observed diminution in support for Islamists even among those who receive services. Again, however, given that this analysis lacks any controls for potential confounds, it is at best suggestive. Further work clearly remains to be done in this exciting and important area. Tarek Masoud is an associate professor of public policy at Harvard University’s John F. Kennedy School of Government. He is the author of Counting Islam: Religion, Class, and Elections in Egypt (Cambridge University Press, 2014). See, for example, Eric Trager, “The Unbreakable Muslim Brotherhood,” Foreign Affairs, July 2011; Shadi Hamid, “How Egypt’s Muslim Brotherhood Will Win,” Foreignpolicy.com, November 3, 2011; and Mohamad Adam, “Brotherhood youth say tight structure is the key to its success,” Egypt Independent, January 27, 2013. See Tareq Yousif Ismael and Rifʻat Saʻīd. 1990. The Communist Movement in Egypt: 1920–1988, Syracuse University Press. See, for example, Michael Penfold-Becerra, “Clientelism and Social Funds: Evidence from Chavez’s Misiones,” Latin American Politics and Society, Vol. 49, No. 4, 2007; Simone R. Bohn, “Social Policy and Vote in Brazil: Bolsa Familia and the Shifts in Lula’s Electoral Base,” Latin American Research Review, Vol. 46, No. 1, 2011; and Susan C. Stokes, “Perverse Accountability: A Formal Model of Machine Politics with Evidence From Argentina,” American Political Science Review, Vol. 99, No. 3, 2005. Janine Clark, Islam, Charity, and Activism: Middle-class Networks and Social Welfare in Egypt, Jordan, and Yemen, Indiana University Press, 2004. For exploration of a similar dynamic in India, see Tariq Thachil, “Embedded Mobilization: Nonstate Service Provision as Electoral Strategy in India,” World Politics, Vol. 63, 2011. Marsha Pripstein Posusney, Labor and the State in Egypt: Workers, Unions, and Economic Restructuring. New York: Columbia University Press, 1997. See Ellen Lust, 2006. “Elections under Authoritarianism: Preliminary Lessons from Jordan.” Democratization 13(3):456–71; and Lisa Blaydes, Elections and Distributive Politics in Mubarak’s Egypt, Cambridge University Press, 2010. Nathan Brown, When Victory is not an Option: Islamist Movements in Arab Politics, Cornell University Press, 2012; Melani Cammett and Pauline Jones Luong, “Is there an Islamist political advantage?” Annual Review of Political Science, vol. 17, 2014.